Went to her new home on Friday 22nd January 2010. 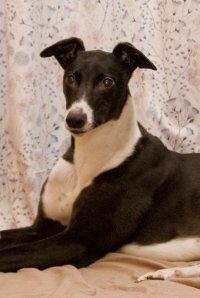 Melody is a small black and white ex-racing greyhound who was born on the 21st August 2005. 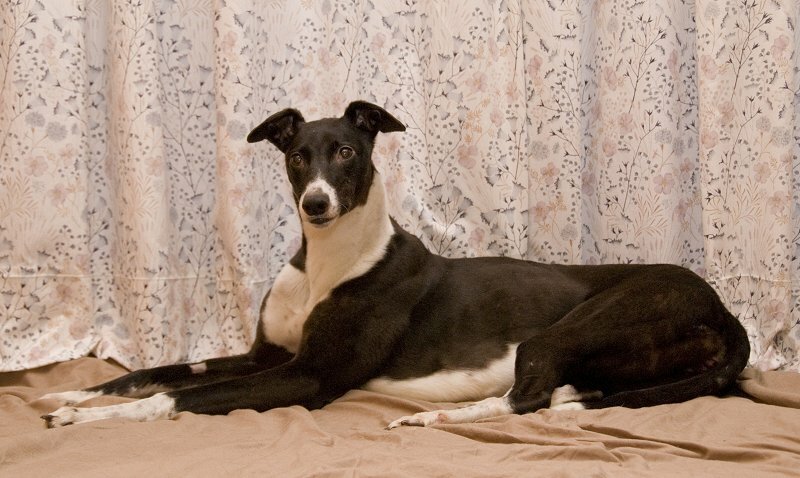 She has a lovely, friendly, laid back approach to life and is house trained, inoculated and spayed. She loves children, is okay with other dogs, walks nicely on the lead and travels well in the car. Stuart collected a greyhound called Suzie this morning who simply jumped in the back of the car and lay down for the journey home. Upon arriving here she greeted me and what a little cutie! She then met the others, took a walk around the garden on the lead and back into the house where we gave her a bit of food, which she ate very gracefully. Back in the garden again because she didn't do anything the first time then back in the house to explore. Within half an hour she was off the lead in the house and fast asleep in the kitchen. She is so laid back that within an hour of being here she felt as if she'd been with us ages. She was spayed on Wednesday so we examined her stitches to make sure things looked okay and she slept the rest of the afternoon along with the others. of a tumour on her lower spine - She was 9 years old and they felt they were now ready to adopt another. We fostered May so knew her and they mentioned they would like another female. I mentioned Suzie was coming in today, but last night we had no idea what she was like. When Suzie walked through the door within ten minutes of being in the house I knew she was just perfect for them so I emailed to let them know and arrangements were made for them to come and see her tomorrow afternoon. She was so settled in her bed that when the time came to take her for a walk this afternoon we had to get her from her bed to put her coat on because she didn't take the 'cue' from the others that something interesting was happening! On the walk we hardly noticed she was there - her lead was so slack that on occassion I wondered if there was a dog on the other end. On the way back from our walk we took them all in the pub where after about 15 minutes she lay on the rug and never moved - not to people coming and going or to Stuart when he stood to get another drink from the bar. She just lay on the rug and that was it until it was time to leave and then we had to make her stand up to put her coat back on and go home - that was a first! Back home she ate her tea, went in the garden to do her toilet then back inside to her bed for the rest of the evening. She found the dog bed in front of the kitchen fire and lay there a while feeling the warmth from the fire on her back. When it was time for bed, she just went and when I did the last 'head count' of the day she lay on her bed wagging her tail at me. Last night we never heard a sound from Suzie and after we let her in the garden first thing she stayed in the living room behind the safety gate until all our bed and breakfast guests had had breakfast and everything cleared away. She was fine. She's shown no interest in the stairs and to be quite honest we haven't forced her because of her stitches and with having guests staying. This afternoon the family who were interested in her called to see her, fell in love with her - as we knew they would, and we made arrangements for her to go to her new home in a few days time. We discovered today Suzie's racing name and when her new owners heard what it was they wanted to change her name to Melody, which is part of her racing name. From this point on we will be calling her Melody to help her get used to it. around. One of the accidents she actually did on her bed then lay on it, which is very, very unusual. We never noticed it until a while later when she rolled on her back to greet us and noticed the mark on the duvet cover. Oh well - another duvet to wash!. I think I went to bed last night with one ear open because I didn't sleep too well and when I heard Melody's name tags on her collar jingle together I was up to see what she was doing. As I walked in the living room she was standing in front of her bed and was just beginning to squat - I grabbed her collar and pulled her forward to break her 'brain thoughts' so as to stop her in her tracks. Any one would have thought I was trying to murder her by the way she squealed, but she got taken to the back door and put in the garden until I cleaned it up. Back inside and on her bed she gave me a very sheepish look and we both went back to bed! She did the same this morning as she walked through the kitchen on the way into the garden. She walked across the dog bed in the kitchen and squatted on it. Stuart spotted her this time and took hold of her collar to pull her forward to stop her in her tracks and she squealed again. Out she went with the others while we sorted out the bed then back in again to her bed. The rest of the day we let her out in the garden every hour with one of the other dogs to instill the message that toilet is done in the garden. She's been superb while we've been serving the bed and breakfast guest's their breakfasts, quite happily laying on her bed in the living room with the others until everything is cleared away before being fed herself. She is now beginning to wait quietly for her food, often laying in the kitchen, rather than pacing round the table in anticipation as she's done in the past. Melody has taken a fancy to the dog bed in the corner of the living room near the television where she emptied the toy box of all the soft toys and lay them on her bed using them as a pillow. She looked so cute and cosy laying amongst them and when we walk to her to give her a stroke she lifts her back leg slightly as a sign of submission. After yesterday's incidents of Melody being taken out the house by her collar when starting to squat the 'penny has dropped' that when all the others dash into the garden she follows. We haven't had one accident from her today, not one, which is wonderful. She has even started going to the door herself or coming to us for a cuddle then pacing the floor around us - both signs for us to let her out. Yes, she has finally got the message she does her toilet outside. No accidents in the house today and she now quickly follows the others outside, fully understanding what is going on and what she is suppose to do. Life is so much easier! Melody decided today was the day she wanted to see what we were doing upstairs. I was doing the bathroom in room 3 when I heard toe nails on the wooden floor and went out to see who it was, and there she was having a look around. I took her out onto the landing and put the 'dog chain' we use on the doors to stop her coming in again. She peeped through the gap at me for a while then lay on the landing until I came out. She was quite happy laying there while I did the rooms but it mean't I had to chain each door as I came and went to stop her following me in. She wasn't too sure about coming downstairs on her own so I held her collar and came down with her and she was okay. It won't take long for her to grasp that one, and I wouldn't be surprised if she didn't do the stairs on her own the next time. Quite an exploritory day today because this evening we found her asleep on our bed! 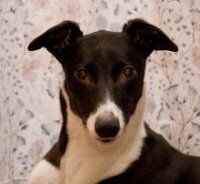 This afternoon Melody's new owners called to collect her bringing with them a brand new red coat with the letter 'M' on the side and a matching greyhound collar and lead. When they arrived she gave them a lovely welcome and she looked really 'posh' in her new coat and collar when it was time for her to leave. An appointment has been made with their vet for Monday to remove her stitches where she was spayed and check her over. Having said goodbye to Melody she happily walked to their car and of to her new home. Our house was very quiet for a while after she'd left so to cheer us and the other dogs up we all went for a walk and a drink in the pub up the road. We only had Melody a week and what a lovely character she was. 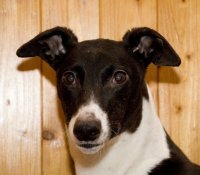 She will make a very loving and loyal companion for her new owners and we wish her a long and happy life in her new home. 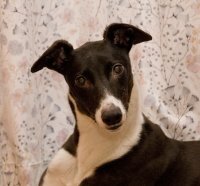 Received a call from Melody's new owner who says she is settling in well and that she is so laid back it's unbelievable. They've been for a walk around the local abbey and visiting friends who couldn't wait to meet her. We received an email today letting us know how Mel was. Sounds like her name has been shortened. Her new owners say they have a seriously laid back dog! As soon as any of the family come home the first thing they do is go and hug Mel!! Since she had her stitches out she has been a totally different dog because they get a mad five minutes during the day when she feels like it and always last thing at night. She takes everything in her stride and nothings phases her at all. Her new owner's friends from school think she's beautiful and those who have met her are amazed at how long and sleek she is. She loves all the attention and always in a very understated and polite way. They still have issues with the stairs because they are very steep, but they have a very ingenious one way system to get her into the kitchen. She goes out of the balcony door and down a few steps into the garden, then trots along the decking and walks down in to the kitchen - she's got it off to a fine art now - especially at tea time. She's very good at coming UP the stairs from the kitchen now but going down is a non starter. She hasn't explored upstairs yet. and they thought that once she got the hang of going up the kitchen stairs she'd try coming up at night, but she just looks, gets as far as the third step then goes to her own bed. They always leave the doors open so she can come up to them at any time. Maybe one day they say they will wake up and she'll be there! They have also discoved that she is not cat friendly when they heard an horrendous noise coming from the garden - at first they thought she'd hurt herself or maybe fallen in the pond, but after breaking the world record for getting from the front bedroom to the back landing window they saw that she had a cat on the garden wall in her sights - needless to say the cat was gone in less than 60 seconds and they haven't seen one in the vicinity since! By the middle of last week she was asking to go outside every time she heard the (very big) dog from down the street barking - she would stand on the balcony and give it what for - They didn't realise she had such a loud and deep bark until then. As soon as the other dog went quiet she came back inside feeling very pleased with herself. They are not sure what she said but they haven't heard the other dog very much since then........! She loves her walks and goes at a very sedate pace unless they start to run in front of her and she runs to catch up. Her new owners have also noticed she doesn't seem to like walking on grass very much and prefers the pathways, but then who wants to walk where it's wet, cold and muddy!! She is getting better, but then she doesn't have much choice because Furness Abbey and the surrounding area where they walk is all grass!